The airstrikes against Libya-based terrorists are intended “to get rid of them and to limit their ability to threaten Egypt’s national security,” declared Egyptian Foreign Minister Sameh Shoukry. Last Friday, the day of the attack, Egyptian warplanes bombed camps in Libya that Cairo said were used to train the terrorists who killed the Christians that day. Egypt made clear on Monday that it planned to press ahead with air strikes against Islamist militants in neighboring Libya who it says were responsible for killing Egyptian Christians in an ambush last week. Although the Islamic State (ISIS/ISIL) branch in the region has claimed responsibility for the recent massacre, Libyan operational commander Brig. Abdulsalam Al-Hasi told Reuters the recent airstrikes targeted Majlis Mujahideen Derna and Abu Salim brigade, two local groups affiliated with ISIS rival al-Qaeda. Col. Tamer al-Refaei, a spokesman for the Egyptian armed forces, told Reuters Cairo is going after “anyone” behind terrorist violence in Egypt. Egyptian President Abdel Fattah el-Sisi is launching airstrikes against the Libya-based jihadists in coordination with the Libya National Army loyal to Russian-backed Former Gen. Khalifa Haftar, a leader of the opposition to the United Nations-backed government in Tripoli led by Prime Minister Fayez al-Sarraj. President Sisi has been lending support to Gen. Hafter and his forces in their fight against jihadists and other fighters in Benghazi and Derna, which has been raging for more than two years. The Hafter-led opposition is based in eastern Libya, home to the country’s border with Egypt. The U.S. military has expressed concern about Russia’s presence in Libya. Since the U.S.-backed overthrow and subsequent execution of dictator Muammar Gaddafi in 2011, Libya has descended into chaos, providing a fertile ground for jihadist groups like ISIS, al-Qaeda, and others. Although American-backed Libyan militias dislodged ISIS from its former bastion in the North African country’s coastal city of Sirte, U.S. and Libyan military officials believe the terrorist organization still poses a threat and is regrouping elsewhere in the nation. “Three church bombings since December, also claimed by Islamic State, have killed more than 70 people,” notes Reuters. “Egypt has carried out air strikes in Libya occasionally since its neighbor descended into factional fighting in the years following the 2011 civil war that ousted Muammar Gaddafi,” it adds. 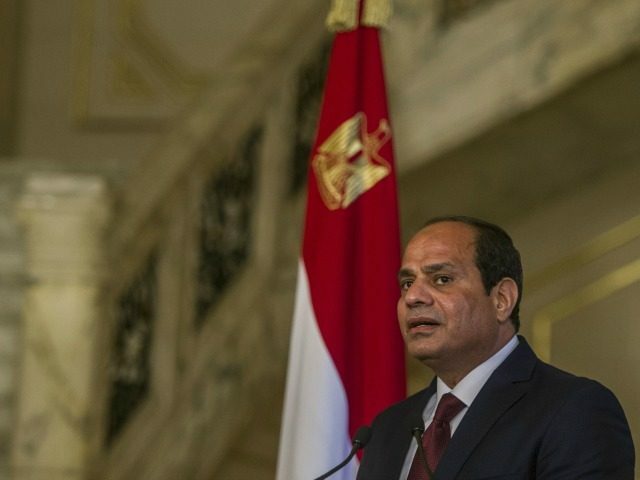 In March, Caroline Doss, the vice president of Egyptian Christians advocacy group Coptic Solidarity, told American lawmakers that the religious minority had experienced a “sharp escalation” in violent attacks at the hands of Islamic extremists under President Sisi’s watch.